RAIN is pleased to announce the first details of the RAIN Podcast Business Summit, June 21 at the AXA Event & Production Center in New York. As podcasting continues to grow in consumer recognition, listening audience, and content creation, the business opportunity also grows for networks and advertisers. The RAIN Podcast Business Summit is the only conference event to define the on-demand audio marketplace — its growth, trends, and opportunities for marketers. Over 20 high-influence thought-leaders will speak at the event, including keynote presenter Jarl Mohn (CEO, NPR), Chris Peterson (SVP, Podcasting at iHeartRadio), and Larry Rosin (President, Edison Research). New research on consumer use of smart devices, produced by Edison Research and NPR, will debut at the event. Several podcasting conferences have sprung up as the category and its personalities have gained publicity. The RAIN Podcast Business Summit is the only gathering which encompasses the entire opportunity of podcasting from the business side, exploring and demystifying issues relevant to advertising media buyers, creators, publishers, and distributors. It is part of the famed RAIN Summit series, the leading knowledge and networking events of the online audio industry for 15 years. 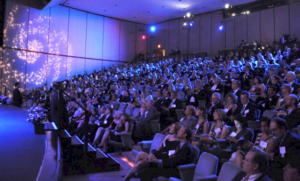 The RAIN Podcast Business Summit will be in the beautiful AXA Auditorium in midtown Manhattan. It is a 9am-1pm event that delivers unparalleled knowledge and networking to its audience — a full-day value in a half-day format keyed to industry professionals. Watch RAIN News for an announcement of ticket sales. Following is the Summit press announcement released to media this morning. Chicago IL — April 19, 2017 — RAIN (Radio, Audio, Internet News), the leading knowledge and networking organization for the online audio industry, announces the RAIN Podcast Business Summit, a new conference for one of the fastest-growing marketing and programming platforms today. The half-day event takes place June 21, 2017 at the AXA Event & Production Center in New York. Podcasts entered the market around 2004 and reached 10% adoption within five years, gaining traction at nearly double the rate of smartphones, which are now used by 81% of Americans 12+ (Edison Research, Infinite Dial 2017). With this growing audience – now 67M monthly listeners – and distinct value proposition for brands, podcast advertising spending is projected to reach $250M in 2017 and exceed $500M by 2020 according to Bridge Ratings. In its inaugural year, the Summit will bring together buyers from advertising agencies, brand marketers, leading podcast networks, show hosts and producers, data experts, and technology companies to explore the dynamic intersection of the buy and sell sides in the burgeoning industry of on-demand audio. NPR CEO Jarl Mohn will open the event with a keynote on the “Evolution of Audio.” Following the keynote, Edison Research will present the findings of a new study on how smart speakers and voice-controlled technology are affecting consumer behavior – research conducted in partnership with NPR, the presenting sponsor of the RAIN Podcast Business Summit. NPR’s Hourly News Summary podcast is the default Flash Briefing on the Alexa platform and is used by hundreds of thousands of people every week. Through new research, discussion panels and interviews, the RAIN Podcast Business Summit will explore the most current issues and topics defining the landscape of podcasting and its opportunity for marketers. By demystifying the challenges, presenting solutions, and forecasting future trends, the Summit will bring important knowledge to all participants who have a stake in the evolution of on-demand audio. Speakers and the full agenda will be released in the coming weeks. The RAIN Podcast Business Summit is part of the highly-regarded RAIN Summit conference series, which for 15 years has illuminated and advocated webcasting, streaming radio, music services, online delivery, and personalized listening. RAIN was founded by Kurt Hanson, Founder and CEO of pioneering internet radio service AccuRadio. Information about the RAIN Podcast Business Summit, including speaker and agenda announcements, can be found on RAIN News, the leading trade publication of the online audio industry. Press Access: A limited number of tickets will be available for press interested in attending the event. Please contact Brianna Pullman at brianna@rainnews.com for details and to request press credentials. it and I have you book marked to check out new things on your website.